Heat oven to 450°F. Line cookie sheet with cooking parchment paper or silicone baking mat. In shallow bowl, mix bread crumbs, pepper flakes, salt and pepper. In another shallow bowl, beat egg with fork or whisk. 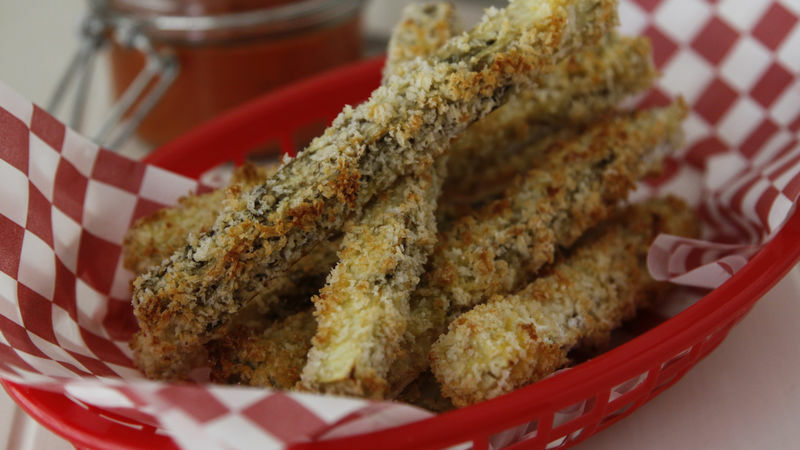 Dip eggplant strips into egg, coating all sides; shake off excess. Roll in bread crumb mixture until coated. Place on cookie sheet. Bake about 20 minutes, turning once, or until coating is crisp and lightly golden. Serve the fries with warmed marinara sauce for dipping. If you can’t find panko bread crumbs, you can substitute Progresso® plain bread crumbs.